VW/Audi boss, Ferdinand Piech, recently spoke to German magazine Frankfurter Allemeine Zeitung, about Audi's aspirations towards Formula 1 and image creation: "É.and anyone without drivers like the two Schmachers will be lost from the start. I will watch that the still good profitability of Audi will not be burned." Drivers are not the only element for success, and those who can lead teams to championships in the manner Michael Schumacher has lead Ferrari, will always end up in a team that has the ingredients needed to win. Assembling those ingredients, which include: a design and engineering team capable of developing and racing a consistently fast car; an engine supplier with an equally effective design/engineering team; being one of the top one or two teams with Michelin, Bridgestone or Goodyear; a fully developed and faithful supplier network; major commercial and technical sponsors; and an effective management and organisation, particularly on the technical side. The top drivers will queue up to drive for these teams. Like any recipe, the result will not be a success if any key ingredient is missing or of poor quality. Ferrari, McLaren and Williams have these ingredients, assembled, developed and tested over several decades. For any other team to beat them, they must put together an equally effective set of ingredients and then learn how to deploy them in a winning way. The problem is that nothing stands still in Formula 1. These three teams are continuously developing, not just the cars and engines, but their racing techniques and their whole racing organisations and businesses. Other teams do catch up eventually, by copying them, poaching their staff, using their suppliers and by inevitable progress. A Minardi will eventually lap a given circuit just as fast as a McLaren, having taken regulation changes, tyre development etc. into account, but it will be some years later. The size of their organisation, their facilities and their race strategies will be just as good as Williams' were ten or so years ago. Every team is progressing at the rate that its resources allow, and Ferrari is progressing fastest at the moment, with Williams and McLaren not far behind. To beat them, another team must not just progress at the same rate in every department, they must progress significantly faster. The days of overtaking a competitor by a masterstroke of engineering innovation have long gone, a victim of tighter technical regulations and the all-optimising computer. The rate of development is a function of the dollars spent. Formula 1 is in the middle of an era of relative technical stability and, as with all development S-curves, the return per dollar becomes less and less. Put another way, it takes ever-increasing numbers of dollars to achieve a 1% gain in performance. However, resources are not the only factor affecting the rate of progress. The two other most important factors are focus and distractions. The automobile manufacturers that have become involved in Formula 1 recently, or who have participated for some time and have recently taken a much larger controlling interest in individual teams, tend to believe that they can outspend and "out-tech." the opposition. However, despite some indications of self-delusion to the contrary, they do not know how to focus those resources into winning in Formula 1. Few people do. Look into the Williams garage, and you will see Franck Williams, Patrick Head, Pierre Dupasquier (Michelin) and Gerhard Berger (BMW). They are all men who have proven that they know what it takes to win, and it is they who are masterminding Williams resurgence. The same can be said for McLaren (Ron Dennis, Adrian Newey and Norbert Haug) and Ferrari (Jean Todt, Ross Brawn and Rory Byrne, with the occasional additional presences of Luca di Montezemolo). Look into the other garages, and you may see more famous star guests than proven Formula 1 winners. Focus is applied and maintained by the one or two people at the very top of an organisation. For most teams and independent engine manufacturers, this means the owner. For Ferrari, it is Luca di Montezemolo. For automobile manufacturers who supply engines or who own teams, this means the Board and the person appointed to head the motorsport activities. 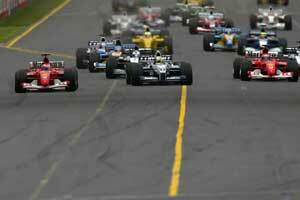 Formula 1 is best served by organisations that are focused entirely on it. Williams have made their comeback having wrapped up their successful Touring Car programme with Renault, and their Le Mans-winning programme with BMW. The later enabled the two organisations to get to know each other, and BMW, under its Racing Director, Gerhard Berger, closed down its other efforts to concentrate on Formula 1. Ferrari is big enough and sufficiently compartmentalised to manufacture road cars, and McLaren appears to be able to as well, although their recent successes have come at a time when their road car activities are quiet, not requiring major focus from senior management. Developing racing engines for two top formulae must stretch any organisation. Honda, Illmor (Mercedes) and Cosworth (Ford) have all attempted to do so with their CART programmes, but only Illmor have gained recent Formula 1 success while doing so, and that appears to be at the expense of their CART programme, now abandoned. Supplying two teams with the latest specification of engine has yet to be proven to be the correct strategy. To do so, as Honda does, may bring benefits in the rate of reliability testing and it does allow Honda to look closely at two potential partner teams. Probably next year they will choose one to concentrate on for a single-minded effort in the future. Supplying equal specification engines to more than one team for economic reasons, as Ford have agreed to do next year (Arrows will pay for their engines), would appear to be a loss of focus - or a different agenda than winning the World Championship. Ferrari appears to have found the best arrangement, in which they sell last year's engine to two teams, for a considerable sum. There is no significant additional R&D to carry out; income is generated; the customer teams get a competitive engine, as Ferrari make consistently good engines and so the incremental improvement year-on-year is not massive; the teams gain electronics/software assistance; Ferrari gains useful allies in times of disagreement between the teams. and they gain first hand knowledge of up and coming young drivers such as Raikkonen. Focus is a policy decision about how closely those whose money is spent on Formula 1 wish to concentrate on winning, and it is entirely up to them and their personal or corporate agendas. History has indicated that Formula 1 demands very close focus to achieve success, and as the effort required increases each year, that is unlikely to change. Much harder to plan for are distractions - all those events, either inevitable and predicable or totally unexpected, that slow down the rate of progress. They may be self-inflicted or inflicted by others (sometimes intentionally by competitors) but which ever it is it takes the minds of those doing the job, at all levels, off it. Probably the most destructive distraction is real or rumoured financial problems. Striking deep at an individual's personal security, everyone financially linked to the team, whether employee, supplier, or sponsor, feels threatened. Employees start to look around for alternative opportunities; other teams start to cherry-pick the best people; suppliers put the team to the back of the queue and demand COD, which further strains the finances. No one's mind is on the main task. A change of ownership may result, but that takes time. Whether for financial reasons or just business, changes in ownership bring changes in power, and employees whether they are affected or not will wonder how the inevitable changes will affect them. BAR has suffered its fair share of ownership uncertainty and Craig Pollock has accused others of trying to de-stabilise the team by rumour mongering. Alain Prost has done the same. How can anyone give their all towards winning when at the back of their mind they wonder whether they will have a job tomorrow? Almost as distracting is a change in senior personnel - Technical Director, Chief Designer, Team Manager, driver - whether planned or imposed. However well an organisation is working, it must dislocate when there is a change of key person, and re-form around the new personality with their particular way of working. Formula 1 teams are political organisations, and there will be those who immediately align with the new person and those who think they are a bad appointment. Opinions about drivers are probably the most voiced, and while the matter is discussed and adjustments in alliances made, minds are off the job. An example of how to do it wrong is the Adrian Newey affair. Both Jaguar and McLaren suffered. Bobby Rahal has subsequently lost his job; the technical staff at Jaguar know they are considered to be lacking in some respect; McLaren know Newey really wants to move on, and have spent some considerable sum in compensation to Jaguar; everyone involved had their eyes off the ball for a few weeks during a critical phase of the season. Ferrari must have chuckled, having just sorted out their key personnel - Todt, Brawn, Byrne and Schumacher - until 2004, all without too much publicity or public discussion about the salaries involved. Even Montezemolo quietly decided to stay with Ferrari rather than take up a high profile position in Berlusconi's new Italian government, having brilliantly stabilised the team with the key personnel's new contracts. Who else would now want to leave Ferrari? Changing engine supplier involves more than the design and engineering changes that are necessary. There is a whole new organisation to get to know and learn to work with. If they are part of a major German or Japanese manufacturer there will be significant cultural differences to adapt to. Language and time differences do not help either. Chassis and engine integration needs a great deal of meeting time and subsequent track testing, just to get back to where one was with the previous, well-understood partner. Pulling out of Formula 1 by an engine supplier, following World Championship successes, always leaves a team in the doldrums for a while e.g. Williams, following both Honda's and Renaults withdrawals, and McLaren after Honda originally pulled out. McLaren have nearly always forged successful, long-term engine partnerships (except with Peugeot, who they quickly realised were not adequately focused). Williams have succeeded too, except when they fell foul of cultural differences between the most English of teams and Japanese Honda. Ferrari do not have the problem, though in the past John Barnard had to make them realise that the engine was no longer the dominant contributor to the overall performance of the car. A new tyre supplier is not so traumatic, but still requires meetings and increased or re-focused testing, diverting efforts from other parts of the car. Successful technical partnerships require a lot of effort and commitment on both sides, through thick and thin. Ending one and starting a new one is a distraction, and inevitably slows the rate of development, however temporarily. A new sponsor can usually be absorbed by the commercial staff, without too much distraction to the technical development. However, senior management and drivers' time may be required for promotional duties during the initial flush of enthusiasm, diverting attention at the start of a season when all workloads are high. The highly developed teams know this and take steps to minimise the effect, thus ensuring the maximum benefit to their sponsors through the TV exposure that accompanies good race results. Expansion is also a distraction. A new factory, wind tunnel, CAD/CAE system or the rapid growth of a department can all cause major disruption, as there is no low season in Formula 1. McLaren have created a department whose sole task is to plan and execute their move to their new mega-premises. One of the hardest things to plan for is when a key member of staff becomes distracted by some factor affecting his personal life i.e. when real life intervenes. It may be medical, emotional or financial, and people do have families. The demands of Formula 1 leave little over for dealing with the rest of life, and the best teams provide personal support to help their employees through such times. The penalties of not doing so are temporary or permanent loss of their personnel in an era when there are simply not enough good people to staff all the Formula 1 teams in existence. As Ferrari found out in 1999, nothing wrecks a Championship bid as much as the loss of a driver. Schumacher was only out for a few races following his Silverstone accident, and came back without any loss of form, but it all but scuppered Ferrari's year and handed the Championship to Hakkinen. Car losses can be planned for, but the loss of a driver cannot. It still surprises me when I hear anyone complaining about the emphasis on safety that the FIA has imposed in the last decade, particularly if it comes form someone within a Formula 1 team. Any injury to a driver will set them back, and a major injury or death is not only a disaster in a Championship effort, but can have a long term effect on key individuals and a whole team. How Williams, and Patrick Head in particular, survived with sanity intact the aftermath of Senna's fatal accident and the drawn-out legal nonsense, is a wonder to me and illustrates the extraordinary strength of the Williams organisation. A Schumacher or a Hakkinen are absolutely crucial ingredients in consistent winning, and no efforts to protect them and maintain their form can be too great. Formula 1 is relentless. There is no time to pause to deal with crises or indeed anything much else. Each year the performance of the cars improves by a few percent in real terms. If one team can gain a few points more than another, they will beat them - provided they were level the previous year. If behind, they must improve by the deficit as well. Ferrari, as a "racing machine" has the greatest rate of improvement at the moment, born on achieving success after so long without a Championship. Williams, with their oft-proven ability to apply themselves in a single-minded manner, are forging a new relationship with BMW that is carrying them forwards at an impressive rate. McLaren are in the middle of or about to be affected by a number of distractions: a move to a new factory; the loss of focus of their Technical Director, Adrian Newey; a loss of focus of their prime driver, Mika Hakkinen; the imminent launch of a new Mercedes, designed and built by McLaren; Illmor's loss of one of its founders, Paul Morgan; even Daimler-Chrysler's corporate problems must be affecting them. They will no doubt pull through these distractions and losses of focus, but it will slow them. Meanwhile, Honda, Renault and Ford are wondering what it takes to achieve the same levels of performance with the teams they have tied themselves into. The simple answer is focus and an absence of distractions over time to provide the stability necessary to increase the rate of development. Whether they can achieve this to the same extent to which Ron Dennis, Frank Williams and Luca di Montezemolo have led their long-established and developed organisations, remains to be seen. And then there is ToyotaÉ..
A little while ago, Toyota described how they had approached the development of their CART engine. Having made an initial foray, and discovered that they were not competitive with Cosworth, Illmor and Honda, they decided that, in order to catch up they must develop at a rate greater than the opposition. They undertook to design and build three new engines every two years, using two design and development teams i.e. around a 50% greater evolution rate than the competitive engines. Toyota has the resources to back such a strategy, and it raised them to about the same level as Honda and Cosworth (Illmor having pulled out). To do the same in Formula 1 is of course not so easy, and Toyota have not yet shown that they are prepared or able to deliver the last few percent necessary to win either the CART Championship or indeed Le Mans. There is no doubt that Toyota will struggle when they first enter Formula 1 next year. They have already had the distraction of a change of Technical Director, they don't yet have their own wind tunnel fully operational, and they are experiencing difficulties in recruiting the best people to work in Germany. However, if any company has the resources to develop faster than the current best in Formula 1, Toyota undoubtedly does. Whether they have the focus and can avoid the distractions remains to be seen. I asked Patrick Head if he would consent to be interviewed for this article on what it takes to succeed in Formula 1. He replied that he could not see any advantages to Williams in talking about the strategies they have employed to get back to the front of Formula 1. I can understand his point.